We offer 2 sizes of Coil Covers in 18 OZ Black Vinyl for 96” W & 102” W. Custom sizes and colors available. 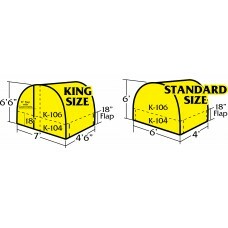 King Size Coil Tarp 18Oz Black 7W X 6'6”H X 4'6”L. Grommets on the hem, 1 row D-Rings up 18” all 4 s..
Standard Coil Tarp 18Oz Black 6'W X 6'H X 4'L. Grommets on the hem, 1 row D-Rings up 18” all 4 sides..